The ability to make one good frittata recipe is something everyone should know. Because once you know one recipe, you can mix and match the ingredients you add to the basic egg mixture and you’ll find you can make dozens of frittatas! For me, a frittata is sometimes a “what kind of leftovers are in my fridge” kind of meal. Sometimes they are a “special occasion, go out and purchase the high-end ingredients” kind of meal. 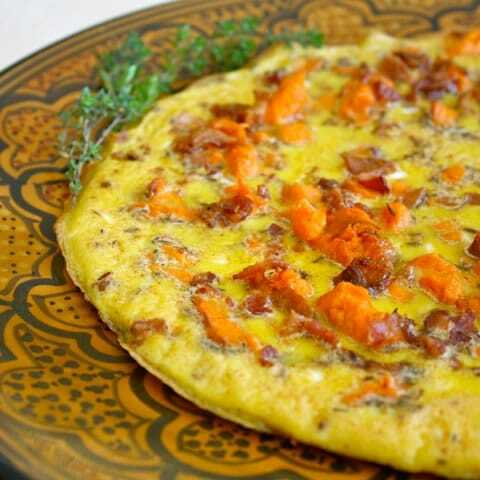 That is the beauty of a frittata, it is a humble dish that can also be dressed up. Have you ever gone out for brunch at a restaurant and they have a few Today’s Special frittatas listed on their menus? What’s happening is that a smart chef is using up his extra produce and protein by making a lovely frittata to sell to his customers, along with a cold mimosa or two! Frittatas fit perfectly into the unprocessed way of eating as they basically contain eggs, along with a choice of vegetables, herbs, cheeses, and meats. I recently posted a recipe for a Chicken-Apple Sausage and Red Chard Frittata on my blog Black Girl Chef’s Whites. I was inspired to make that frittata because a friend with a plot in a neighborhood garden had way too much chard, so she shared a large amount with my family. I blanched the chard so I could use it in a variety of ways, and one of those ways became a delicious frittata. That frittata was a very different style from this one. I call that one a fluffy frittata, because of the large amount of eggs. This one I call a pancake frittata. This frittata is very flat, with a smaller amount of eggs used, to emphasize the intense flavors of the other ingredients. I often roast yams whole in their skin, then they can be eaten like a baked potato, mashed or turned into soup the next day. 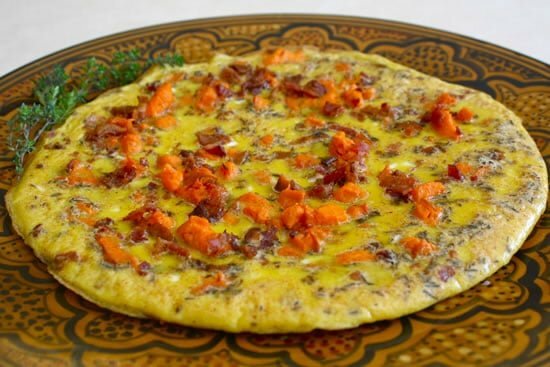 I decided to use a couple of my roasted yams in a frittata for my October Unprocessed guest post. Yams? In an egg dish? I hear you all saying “Ick! Ewww!” I tend to think outside of the box. Hell, they don’t even let me play in the box anymore! Just wait, it tastes fabulous! Although I tried to keep the frittata vegetarian, the one thing that kept popping into my head to make it taste really, really good was bacon. The melding of sweet yam, smoky bacon and spicy chile pepper works very well in this dish. Sometimes thinking outside of the box is a good thing! Although I am an omnivore, I make a conscious effort to only buy meat and poultry from sources that humanely raise their meat, which means pasture raised pork and lamb, grass-fed and/or organic beef, and free range and organic chickens. If you are not a pork bacon eater, try substituting turkey bacon, veggie bacon, or sautéed thinly sliced shiitake mushrooms. When it comes to the spice/heat factor, I gave a range on the amount of chipotle pepper to use. If you like it hot, use more. Feel free to use your favorite type of chile pepper, or substituting with a hot smoked paprika would also be nice. I call that one a fluffy frittata, because of the large amount of eggs. This one I call a pancake frittata. This frittata is very flat, with a smaller amount of eggs used, to emphasize the intense flavors of the other ingredients. Melt the butter over low heat in a large oven-proof skillet. Add the yams, heat slowly for 3-4 minutes, turning yams once. In a medium bowl, whisk the eggs, salt, thyme and chipotle pepper together. Set aside. Sprinkle the crumbled bacon over the warmed yams, then pour the egg mixture over top. Place the skillet on the middle rack in the heated oven. Bake the frittata for 8-10 minutes, or until the eggs are set. Loosen the edges of the frittata with a spatula and slide it gently onto a serving plate. Cut into six wedges and serve. Cheryl Lee is a classically trained chef who has worked alongside famous Chef Emeril Lagasse and assisted his culinary team on the cooking show Emeril Live. She has also worked for a variety of cafés in New York, and has been a Chef Instructor at the California School of Culinary Arts. Cheryl is the recipe developer, food stylist, photographer, and chief dishwasher for her blog Black Girl Chef’s Whites, focusing on real food that anyone can make. You can also find her on Facebook, Twitter, and Pinterest. I was just going to suggest some smoked paprika if someone can’t have bacon. I see great minds think alike! This looks fantastic! Frittatas are a good to meal at my house, and I just got some yams from the CSA box. I’ll have to give this a go! I love yams, I love greens. I can only eat eggs if they are IN something, or well-blended before cooking (i.e. scrambled, etc) – not allergy, I just can’t stand egg whites. This sounds like something I’ll enjoy. Smoky MILD paprika will make an even better substitute for the chipotle than it would for bacon, which I also eat happily. This is fantastic! Am having a dinner & a movie night for some friends on Saturday. This fritatta will be perfect. I just love all these awesome OctUnPro recipes. Thank you! BTW, I will make some corn tortillas to serve alongside, as well as some roasted tomato/onion jam. Man – it’s so great to hang at my house – if nothing else, you will eat well!